Funko continues its popular line of DC Comics Rock Candy vinyl figures with a wave based on the new DC Comics x Mattel franchise, DC Super Hero Girls! 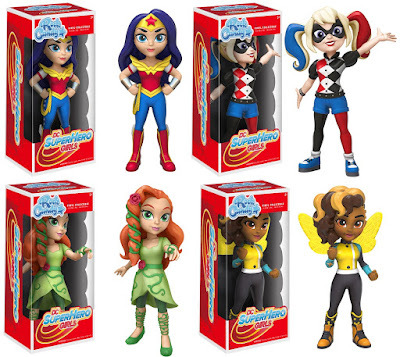 The DC Super Hero Girls Rock Candy Series includes 5” vinyl figures of Wonder Woman, Harley Quinn, Poison Ivy and Bumblebee. Now everyone can add these students of Super Hero High to their Funko collection! Each DC Super Hero Girls Rock Candy Vinyl Figure features a different stylized action ready pose and comes packaged in a full color window box perfect for display. Collectors can pre-order all four DC Comics figures now at Entertainment Earth for $10.99 each here.